Summer wanes, the temperatures drop and Oregon’s forests move into fall party mode. From mountain forests to river valleys around the state, a riot of color celebrates the changing of the seasons. Get out and join the festivities by bike, by car, by train or on foot. 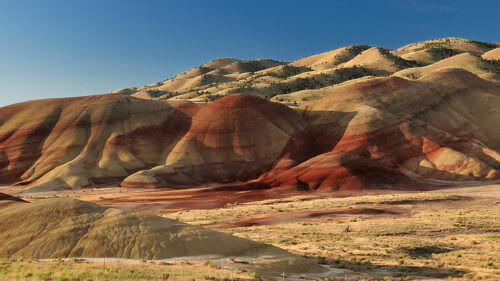 But do you know where to catch the dramatic colors just as they’re starting to turn or reach their peak? Mid- to late-October tends to showcase the best fall foliage in Oregon — although the timing varies by region. Peak colors often hit the Willamette Valley and Central Oregon a few days to a week earlier than Southern Oregon and Hood/Gorge, while Northeastern Oregon leaves can take even longer, with the brightest colors emerging as late as mid-November. 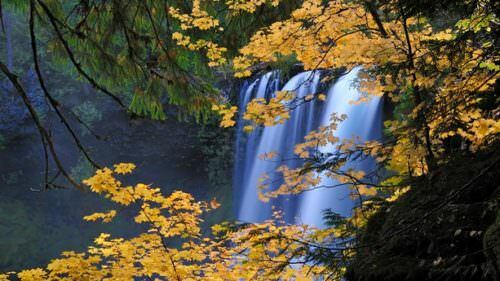 Make sure to check the Oregon Fall Foliage Blog before your trip. Beginning September, weekly updates will point you to where you can find the best fall color around the state. You can also follow fall foliage updates on Twitter and share your own fall photos by tagging them #ORFallFoliage and #traveloregon on Instagram. Take in views of autumn fields and vineyards along the Willamette Valley Scenic Bikeway. The 134-mile route starts in Champoeg State Park north of Salem and ends in Armitage County Park in Coburg, and can be ridden in its entirety or in sections. Look for the fiery reds and oranges of maturing grapevines and golden leaves of walnut trees in towns along the route. The 36-mile Covered Bridges Scenic Bikeway starts and ends in Cottage Grove. Riders pass over six covered bridges (three on the historic register) and through a bright yellow tunnel of cottonwoods. You’ll see colorful oaks along the hillsides. Follow the Rogue-Umpqua Scenic Byway in Southern Oregon from Gold Hill east of Grants Pass north toward Crater Lake (an easy side trip) then west through Glide to Roseburg. The route takes you past several volcanic peaks, rushing rivers and fall splendor in the Umpqua National Forest. In Central Oregon, the Cascade Lakes Scenic Byway offers an one-of-a-kind view with dazzling red vine maple juxtaposed against black lava. Discover waterfalls, overlooks and forests bright with seasonal color in the Hood/Gorge region, where you can take the Mt. Hood Scenic Byway around Oregon’s tallest peak. From there, follow the river east to the charming towns of Mosier and The Dalles or loop back west to Troutdale and Portland. Through October, the Oregon Coast Scenic Railroad, departing out of Wheeler, offers the Nehalem River Fall Splendor Excursion Train with gorgeous views of Nehalem Bay and the red and orange palette of maple and poplar trees among the evergreens. Meanwhile in Eastern Oregon, the Eagle Cap Excursion Train winds out of Elgin and into lovely roadless forests along the Grande Ronde River to meet up with the Wild and Scenic Wallowa River near the mountains. Check out the Fall Photo Run and other special themed trips — like wine and cheese, brews and brats or an autumn “train robbery” — to see golden larches and bright yellow leaves of cottonwood and willow trees. Near Baker City, hop aboard the Sumpter Valley Railroad, a vintage 1915 steam locomotive, as it travels through old mining country. October sees Fall Color Trains and a special weekend for photography. The Upper Deschutes River Trail is popular for leaf peeping in Central Oregon, starting at Meadow Camp picnic area and following the riverbank’s colorful fall foliage to the spectacular Lava Island Falls and Dillon Falls. Best of all, the hike is as long as you make it — but the easy terrain and inspiring scenery will probably keep you exploring. In Eastern Oregon, the Strawberry Mountain Wilderness lights up with golden larches, dogwoods and cottonwoods in the autumn. 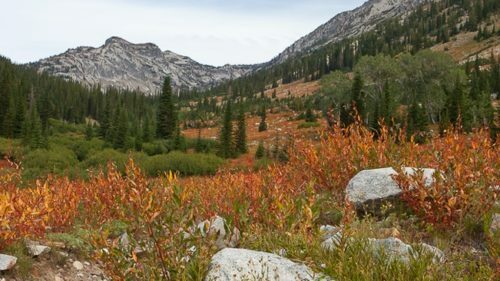 An easy 5.8-mile route along the East Fork Canyon Creek hike (with a trailhead south of Canyon City) is a good bet for fall color and solitude.